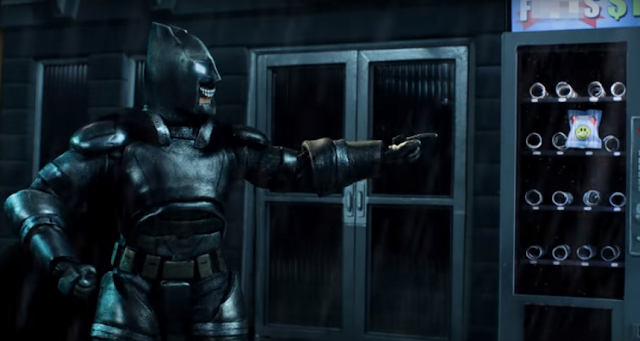 It was only a matter of time before Adult Swim's Robot Chicken produced another DC Comics parody and their target, this time, was Batman V Superman: Dawn of Justice. The most polarizing film of the year was ripe for parody as we've seen in meme form since its release in March. Surprisingly, the "Martha!" joke isn't used here which was probably for the best since it's getting played out but it does show Batman's insistence on expressing to Superman just how many f**ks he has to give. It's not many but the gag goes on long enough to make you wonder he must have had plenty to give to be so elaborate. Anyway, a frustrated Superman takes off leaving Batman and his bit to himself. Some of the best parodies that took jabs at DC heroes have been done by Robot Chicken either as gags in certain episodes or in the three DC Comics specials they've done. Even a month of variant covers were produced using Robot Chicken animation. We'll probably see more parodies especially with Suicide Squad being released this August.